COMPASS Now is a review of community needs in the Great Rivers Region. 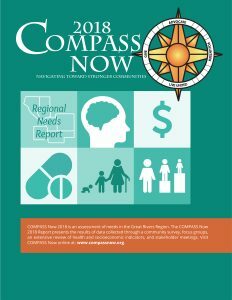 The COMPASS Now Report provides valuable information and presents the results of data collected through a community survey, focus groups, an extensive review of socio-economic indicators, and an inventory of community resources. The purpose of the COMPASS Now Report is to serve as a reference tool and foundation for action plans that solve problems long term. Questions about COMPASS Now? Please contact Liz Evans at (608) 796-1400 or levans@gruw.org.